Google Applications for Education offers an ad-free version of Google Applications to K-12 schools. Google Applications is a rich set of web applications that includes e-mail, chat, web hosting, collaboration, and document editing. For more information on the features of Google Applications for Education visit: The Google Apps Help Site. When you sign up for Google Applications you will need to verify ownership of the domain within 7 days of signing up. Google does this verification via a DNS query. Google will present you with a unique CNAME entry that you insert into the Network Management Tool. Google will then query the DNS server to see if the record is present in the DNS zone file. This record must be maintained in the Network Management Tool as Google will verify your domain on a regular basis. To insert the CNAME do the following. Access the records for your domain name inside of the Network Management Tool. Go to New Host and enter the subdomain and select the proper domain. Click "More" and enter the given CNAME entry in the "This host is an alias for (CNAME)" text field. *Note: If you are currently using your own e-mail servers, you will need to contact the help desk to have the old records removed. Open the Network Management Tool. Hover over the "List" button and Select "Domains". Select the domain that Google Applications will use. If Google Applications is to be setup on the root level domain (eg. networkmaine.com), select the "@" entry. If a subdomain, select or create the subdomain entry. In that same window we will need to add the SPF records. SPF (Sender Policy Framework) records are used to prevent source address spoofing. They will need to be in place as unspecified or invalid SPF records are a common reason for servers rejecting incoming SMTP traffic. If you use an SMTP server for outgoing e-mail other than Google's, you will need to edit the records to reflect it. Google Applications allows users to create and manage their own websites via the use of templates. It is best to setup sites to work on a subdomain such as "sites.yourdomain.org." Login to Google and click "Dashboard." Select "Change URL for Sites." Select and enter the custom subdomain (in our example, enter "sites"). Next you will need to setup the subdomain in NetworkManagement. Enter the hostname and select the appropriate domain name. Enter ghs.google.com in the field labeled "This host is an alias for (CNAME)." Jabber is an IM system that allows for interaction between users in your organization and users outside your organization. It is open source and supported via a number of mainstream clients such as Adium (OS X) and Pidgin (Windows/OS X/Linux). To intercommunicate between jabber servers and to allow clients to directly connect using the domain name as the server, the following records need to be added. Open up Network Management Tool. Hover over the "List" button and Select "Domains"
Can mail be migrated from Horde or other IMAP accounts to a user's Google Apps E-mail Account? Yes. Google offers a batch migration utility to copy existing e-mails from an IMAP inbox. For more information view http://www.google.com/support/a/bin/answer.py?hl=en&answer=172212. By not adding the SRV records for Jabber, does that make Jabber work for only local users? No. Jabber will still work internally within Google (eg. GoogleTalk, other Google Apps domains). If you would like to disable chat, disable it in the Dashboard control panel. Can I use Google Apps E-mail with my existing BlackBerry service? Yes/No. Google Apps e-mail cannot use BlackBerry's push service due to the username containing a @domain.tld. Google offers an application that can be installed on devices to access e-mail. This does however require a data plan. I have multiple domain names that share the same users, can I run Google Applications on all of these? Yes. Go to Domain Settings inside of Google Applications and click "Add a domain alias." You will have to repeat the configuration steps in Network Management Tool for your new domain. Can I setup Google Applications on a test domain? Yes. Register for Google Applications with the domain you intent to setup and complete only the initial domain verification. After you have verified ownership, add a second domain to Google Applications via the Domain Settings tab. You will then follow the tutorial using the second domain you added. Once you decide to fully migrate, follow the instructions on the primary domain. 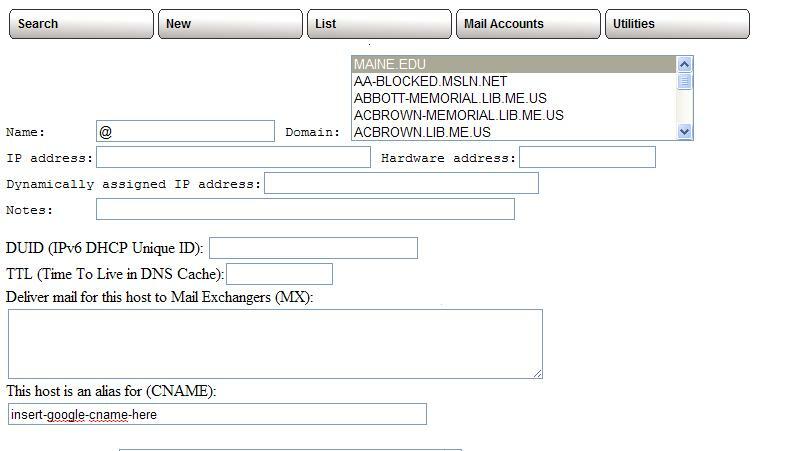 Will Networkmaine still be able to assist in e-mail configuration and troubleshooting issues. Networkmaine will be able to assist in setting up the configuration to point to Google. Once the configuration has been setup to point to Google, users will have to contact Google for support.